Where have all the axe heroes in metal gone? Remember the days when everyone wanted to emulate everyone from Randy Rhoads to Yngwie Malmsteen? The height of popularity for instrumental records took place during those neoclassical shred days which reached a peak during the mid to late 1980’s, only to take a sharp left turn a decade later as consumers (at least in the United States) favored alternative/ grunge music and left traditional metal forms by the wayside. Greek guitarist Gus G. has helped reignite that love of traditional power riffs and blazing energy for the past two decades, through his work in Firewind, Mystic Prophecy, Dream Evil, Nightrage, and Ozzy Osbourne among others – beyond his recent solo album outings. His third solo album Fearless features a power trio format and a focused approach – vocalist/bassist Dennis Ward taking on co-songwriting duties beyond his professionalism on the recording/production front, and Evanescence drummer Will Hunt holding down the tempos. There are more Firewind elements in many tracks than the previous two records – and a great balance between the vocal-led cuts and the instrumentals. We reached out to Gus via phone to catch up on the recording and thought processes behind the album, how the power trio format works this go around, and sprinkled in some discussion regarding his clinic work and Firewind of course. Dead Rhetoric: It feels like this time around for Fearless, you developed material that was more in a direction people have come to expect with Firewind while still injecting that modern hard rock nature of your previous two solo outings. What was the game plan this time around when you created these songs? Gus G.: The whole idea is always first of all to write good songs. That’s always what we are aiming for. With this record, it was more about defining what my sound will be as a solo artist rather than experimenting which was the case on the first two albums. They were just different pieces here and there- I thought the material was good on those records but I would have a glam rock track, then a retro rock track, then a modern heavy track, or a metal instrumental kind of thing. There was a lot of stuff put together- whereas this album had more of a flow and more of a cohesiveness. Dead Rhetoric: The instrumental title track appears to have references in some of the riffing and lead breaks to axe heroes like Eddie Van Halen and Joe Satriani – would that be a fair assessment? Gus G.: Absolutely! There’s tapping and Eddie Van Halen invented that, and anything that you ever do that involves tapping is a reference to Eddie Van Halen. All kidding aside, there’s a part in there that specifically is very Satch-boogie like. Whenever I write an instrumental track, I always have Joe Satriani in mind, even though I sound nothing like him. What I admire about him is how he is able to make the guitar replace a voice with the guitar. He makes the guitar sound interesting throughout a whole record of instrumentals. That’s something I wish I could do- but there’s only one Joe Satriani. That’s why I admire him and he inspires me for instrumentals- even though I do them in my own style. 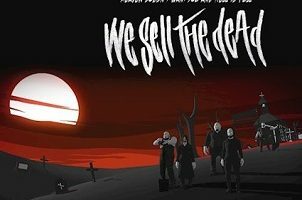 Dead Rhetoric: Did you also know which tracks you wanted to be instrumentals, as you have three different instrumentals on this album versus the seven vocal-led songs? Gus G.: I knew the song “Thrill of the Chase” was going to be an instrumental song, but the other two “Aftermath” and “Fearless” are heavier, and they were destined to be vocal tracks for Firewind. In the case of “Fearless”, I quickly realized when I had the main riff that this is a very technical part and it’s very busy on the guitar- and obviously would make a really cool instrumental if I developed it in that way. I quickly changed my mind and based the rest of the parts around that main riff. It became this crazy ride of constant mood changes and different riffs and melodies, and somehow it all comes back together again. Dead Rhetoric: Were there any songs that went through big changes from the demo stage to the final output on the record? Gus G.: I think the one that was the hardest song to write, and we had to do quite a few arrangements for it, was “Last of My Kind”. It was one of those things that starts with the acoustic part, and Metallica kind of riffing and then gets groovy. I had all these different riffs that kept coming up. Usually I’ll have two or three ideas and then I’ll put them together, but with this track it kept developing and having a lot of stuff. I needed a lot of re-arranging, and Dennis Ward helped me to basically do that. That must have been the most difficult one, the rest of the songs came together pretty easily. Dead Rhetoric: Were you always a fan of the Dire Straits song “Money for Nothing” growing up? Do you enjoy taking non-metal/hard rock material and reinterpreting it for your audience? Gus G.: Absolutely. It was one of those songs that I always loved as a kid growing up. You heard it on the radio, always a good mood track. I liked the whole main guitar riffs, the video was so cool with the graphics and the humorous approach they had. I had this idea of making a really heavy version of the song, so I tried it out as a demo and it seemed like something we could try to see how it works out. It’s almost kind of scary how we made the song our own. Dead Rhetoric: How different is it for you to work on a record from a power trio perspective – does it give you a sense of freedom to be more creative with the interplay and tightness of the arrangements? 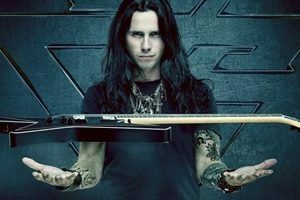 Gus G.: It always depends on what kinds of players you have on the record. I had two other great musicians by my side on this one. I’ve always had good musicians on my records- but the whole thing just started by myself and Dennis as co-writers. Dennis is a killer bass player, and he’s a multi-talented guy. He also did all the pilot tracks for the vocals. Usually I play bass on the demos, and he decided to also play the bass on those demos. He’s an excellent bass player- he is such a good bass player because he moves around, he doesn’t just follow the riff and he enhances the riffs that I play. With a solid foundation right there, and then when a guy like Will Hunt joins up – he’s got an amazing groove and swing, so he just lifted things. It turned out to be a really good choice of players to have on this record. They really took the material and brought it to another level as well. Dead Rhetoric: Were you aware of how great of a singer Dennis was as well? Gus G.: I knew two years ago because when we did the last Firewind album Immortalis together, he was also writing the vocal lines there. When I was sending the demos for this album to the guys, everybody thought this guy sounds great- and I said to myself, almost too good. We have a great singer (with Henning), and he was able to turn these songs into his own style, but for this project I knew that I might not be able to find someone to do the melodies on their own and make it sound good, it’s a tough task. Asking a singer to a set of songs that are already written and try to put their own vibe on that, it might not always work. In the end we had all these discussions, so I’m glad that Dennis stepped up and said he would happily do this. He was also the one who suggested the power trio idea. At that point it hadn’t even crossed my mind, so he said he would play bass and sing if I would like. If he was going to do that, he had to be prepared to go and do this on tour, otherwise it wasn’t going to work. He said he would do that- according to him, it’s one of his childhood dreams to be able to play in a power trio set up. 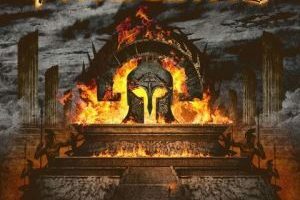 Dead Rhetoric: How do you feel about being one of the major players that helped reignite interest in the Greek metal scene overall during the past couple of decades? 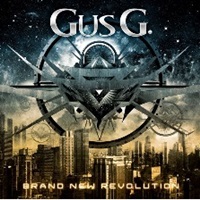 Gus G.: Wow! I haven’t thought about that in that way. (laughs). I think it’s always good if you inspire somebody in the younger generation, open the door in some sort of way – especially in our local scene here. I think it’s kind of cool nowadays to not be considered such a taboo, a metal band from Greece. Ten years ago they would have said, ‘wow- they have metal there?’. I thought people only wear togas there! (laughs). It’s cool, it doesn’t matter where you come from anymore. We helped open that door into more of an international thing and put the country on the map, we are proud to be on the frontline, that’s for sure. Gus G.: You are right. Somehow when we first came onto the scene, because when we first started out we didn’t have success in our country- our biggest market was Japan, and that was unheard of nearly 15 years ago. A Greek band touring Japan and selling records there, and then we started touring Europe and we came to America to do tours there. We suddenly came back to Greece and we started filling big venues in our home country. Somehow it connected with the younger generation at the time, and maybe some of the kids found that faith- and that we are local guys, they are our heroes, and we can do it. This is possible and not impossible. We broke the barriers for the younger generation, and as a result things seemed to pick up for the local scene. Dead Rhetoric: Many fans felt disappointed that Firewind could not make it to the United States to tour for your last album Immortalis – can you fill the readers in on why there are times where as much as you want to be able to tour everywhere, things just do not fall into place? Gus G.: Yeah, I’m sure all 200 of them were very (disappointed)! (laughs). The fact is that Firewind has tried to tour the states a number of times, it just doesn’t seem to work out very well for us much. We will go to major markets of course and we will do fairly well, but then especially some of the guys in the band were not exactly keen on doing extensive tours there. It’s a big cost with all the visas and flights, and our kind of music doesn’t seem to pick up there like other types of music. The extreme style of music seems to be more of a big hit in the states then traditional metal like we are doing. After trying for a few years we decided to play the main places on this record – and hit the countries that we knew we were going to do at least pretty well and see where it goes from there. Honestly this tour was not supposed to be that long. We set out to do 20 shows across Europe and maybe a few festivals- we were just aiming primarily at festivals. The album was received so well, we ended up getting offers, we went to Russia and Latin America as well. We decided to try some new territories- and we left out North America, but we left out Asia as well, which is also one of our good markets. I feel bad that the fans in North America didn’t get the chance to see us on tour for this album. You never say never, I’m sure that we are going to come back and do something there in the future. Dead Rhetoric: You’ll be conducting some guitar clinics beyond the normal touring activities this year – what are some of the aspects you cover in your clinics, and what types of questions or feedback do you receive in this up close and personal encounters during the clinics? Gus G.: The way I do the clinic is I play to some backing tracks, solo stuff and Firewind material included. I encourage the audience to do Q+A, and it can be about anything – not just music related, we can talk fishing and gardening too. To me it’s an opportunity and people are excited because they get to pick my brain – but it’s also an equal opportunity to pick their brains, as I get to hear what they are thinking, how they feel about certain things, and get into the psychology of the fans. I see how they feel about things, and it helps me understand more about my demographic and what my fans like. Dead Rhetoric: Do you believe your audience demographic has changed through the years? Gus G.: No- it’s basically just older dudes! (laughs). That’s my audience. Occasionally I’ll get kids, or younger guitar players and that is cool. Primarily it’s a male audience, and guys that are mid-20’s to mid-30’s, and sometimes older than that. It’s more of an adult audience- what I’m doing apparently is like a dying breed or something. I guess that’s why we have a song on this album called “Last of My Kind”. There aren’t a lot of guys in my age group doing this style of traditional heavy metal, usually it’s the older cats. One thing I have to say about my audience, they are very loyal and very supportive. We grow old together, which is a very cool thing. Dead Rhetoric: Now that you have stepped away from Ozzy as a guitarist, what do you think were some of the biggest takeaways that you learned when you are stepping up into that slot to playing large arenas and festivals that you can apply to your own solo career or with Firewind? Gus G.: Just that experience alone, it was a big school, you know? To play at that level, and just play all those big shows, the performance part of it. The preparation, not only physical but mental as well. You up your game as a musician, a lot more people are watching, a lot more people are listening. It was great, I took a lot of stuff from that experience. Dead Rhetoric: Your father growing up sang Greek folk music in bars and taverns. How supportive has he been of your music endeavors, and do you believe you gained deeper insight into performance through his work? Gus G.: Honestly, he played a major role into my musical upbringing. He turned me on to the first rock and roll, he taught me with vinyl records about the world of Santana, Pink Floyd, The Eagles, The Beatles, and stuff like that. He was very supportive, when I asked him to buy me a guitar and get some lessons. Dead Rhetoric: What’s on the horizon for the rest of 2018 into 2019 for Gus G? Has songwriting begun for the next Firewind effort? Gus G.: Oh no, I just got off the road with those guys – I don’t ever want to see them again (laughs)! No, we are just going to take a little break- we are going to do a few festivals over the summer, it will be a while until we do another album- probably a couple of years. I already have some ideas in my mind of what the next (Firewind) could be about. Right now it’s time to go back into solo mode- there’s going to be a lot of touring for the rest of the year with this solo band, probably into the spring of next year.